- Saturday's weather was warm but cloudy, foggy, and a chance of drizzle. 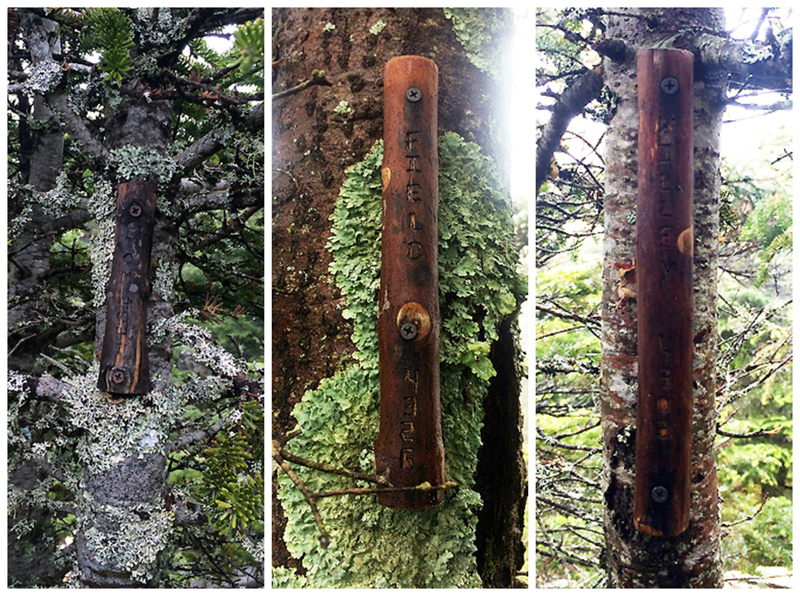 Obviously it's not hiking weather for views but it is perfect weather for a hike in the woods, so I headed to the top of Crawford Notch for a late morning / early afternoon hike of Tom, Field, and Willey. While not the most exciting peaks on the White Mountain 4,000 footer list it is a great starter hike for those who want a taste of what they can expect if they decide to undertake the whole list as there is a short but extremely steep burst over horrible footing on the Avalon Trail just above the A-Z trail junction. So if that doesn't phase you then you'll really enjoy wants in store for you as you continue your 48 journey. 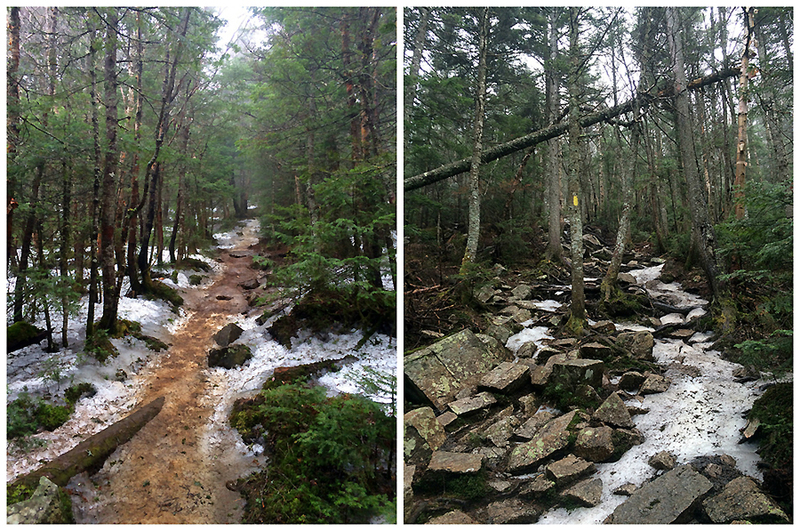 - If you asked me on April 1st when the snow and ice would have melted away from the trails I would have said early May. Unfortunately, April was really cold and May is off to a cool start so the ice is still holding on sporadically above 3,000 to 3,750 feet, and consistently above 3,750 feet. It should be gone in another two weeks but until then light traction is still a good idea for safe/easier travel. - On my way up I passed by Steve, Holly, and their dog Kibo as they were on there way out. It's always nice to see familiar faces on the trail especially ones I haven't seen in over a year. I thought I'd see other recognizable hikers out today but they were the only ones. However, there were several others out and about, maybe around two dozen total throughout the day and about six other dogs. 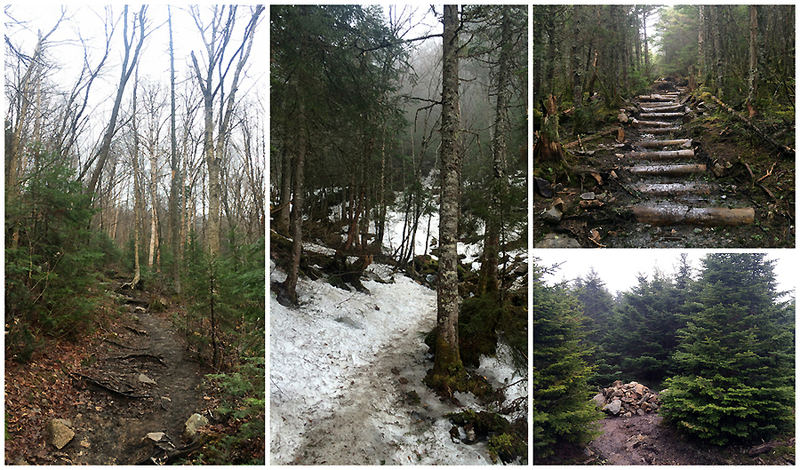 - The trails had all sorts of conditions, dry, mud, ice, snow, running water. I used my microspikes from the A-Z junction to the Mount Tom Spur, barebooted up and down Tom's summit cone, put them back on for the entire hike along the Willey Range Trail, and most of the way back down to the A-Z junction on the upper steeps of the Avalon Trail. The ice is definitely softening up and melting quickly but it still has a way to go before it goes away for good. 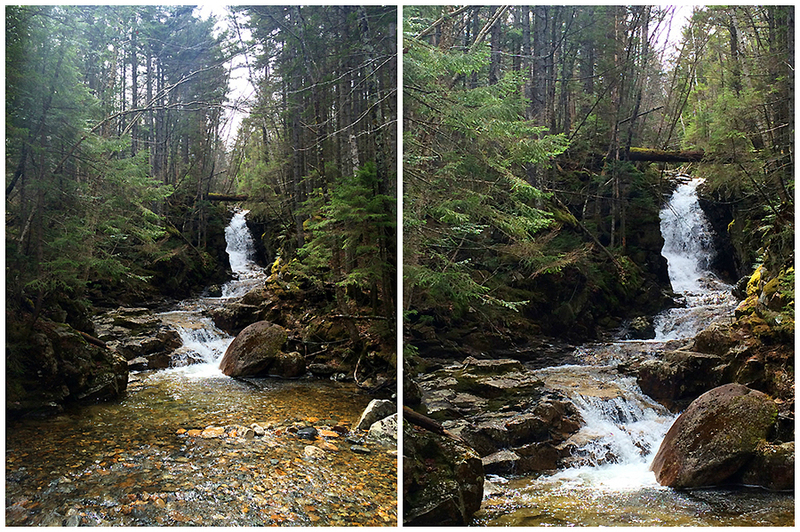 - On the way out I headed by Pearl and Beecher cascades, a short trail that parallels the Avalon Trail for a few tenths of a mile. 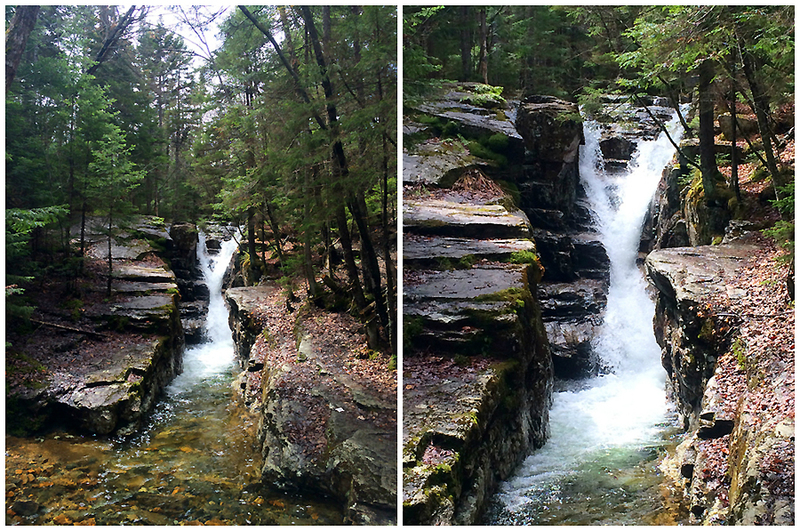 It had been a few years since I checked it out and I highly recommend it as the two cascades are pretty during a good water flow. Also, just above this side trail there is a herd path off the Avalon Trail that heads to another cascade/gorge which is a really cool too. Heading up the Avalon, A-Z, and Mount Tom Spur to Mount Tom's summit. 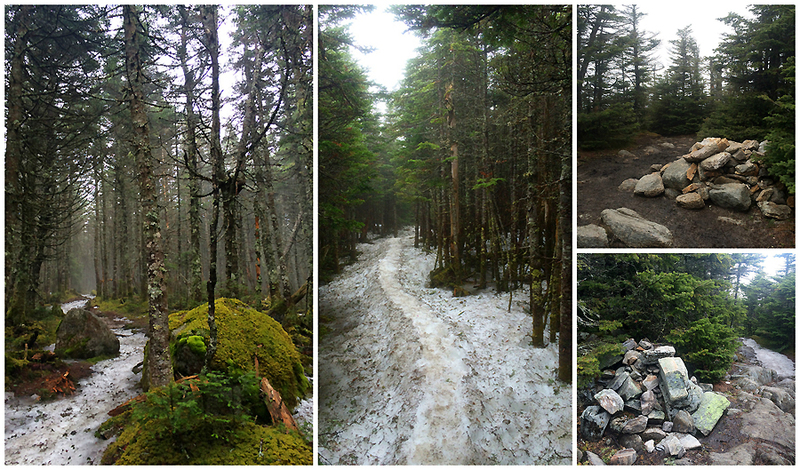 Ice started around 3,000 feet but wasn't too bad on the way up to the summit. Watch out for that crevasse! The summit sticks of Tom, Field, and Willey, I have been on each of these summits close to a dozen and-a-half times but never thought to look for these! Chris - I've never seen those stocks either! Thanks for posting them. And thanks for the news about Whitney.